In the lab we colloquially refer to our glassware as Pyrex, which is of course the brand name of a widely used line of borosilicate glassware employed in laboratories and kitchens the world over. If you have a thick glass measuring cup with metric and Imperial measurements printed in red on the side located somewhere in your kitchen, congratulations! You most likely own a piece of Pyrex all your own and are just as likely acquainted with the indispensability, lifelong durability, and dare I say, understated elegance of ‘tempered soda-lime’ glass. 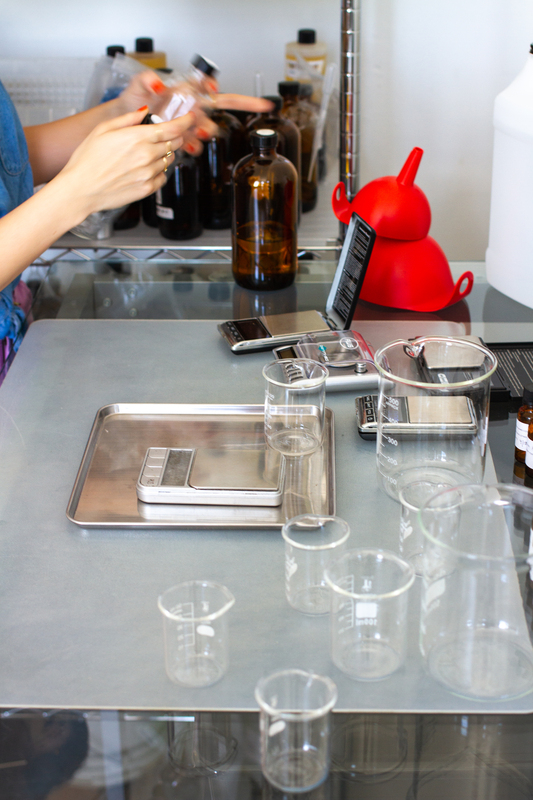 Here in the studio we use Pyrex glass when measuring, pouring or storing fragrance materials precisely because it’s chemically inert — or at least for our purposes seems inert because the silicon-oxygen bond is extremely strong. That means that while hydrogen fluoride (aka hydrofluoric acid) is one of the few materials that can actually damage glass, any of the volatile molecules present in the aromachemicals and essential oils we use aren’t able to interact with glass to degrade it; the same cannot be said for most plastics and a great many other materials. 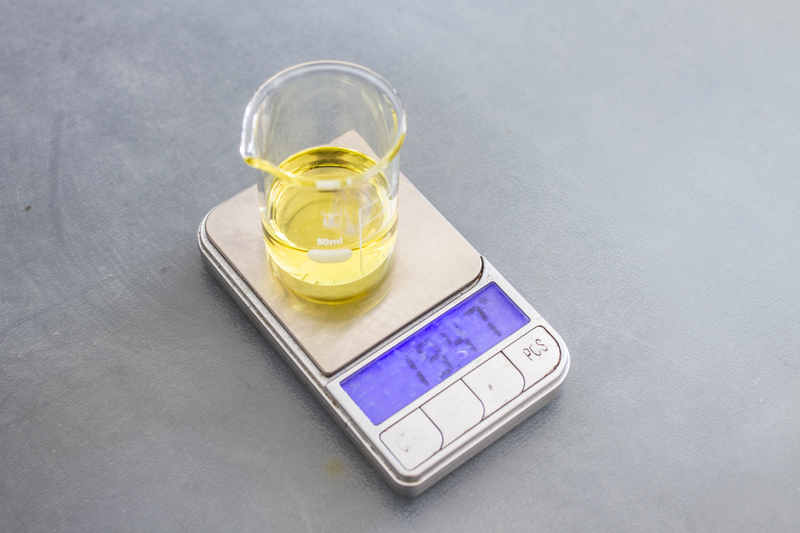 In terms of our favored Pyrex-ware, we’re partial to the smaller cylindrical beakers for measuring out small amounts of each fragrance material at a time. 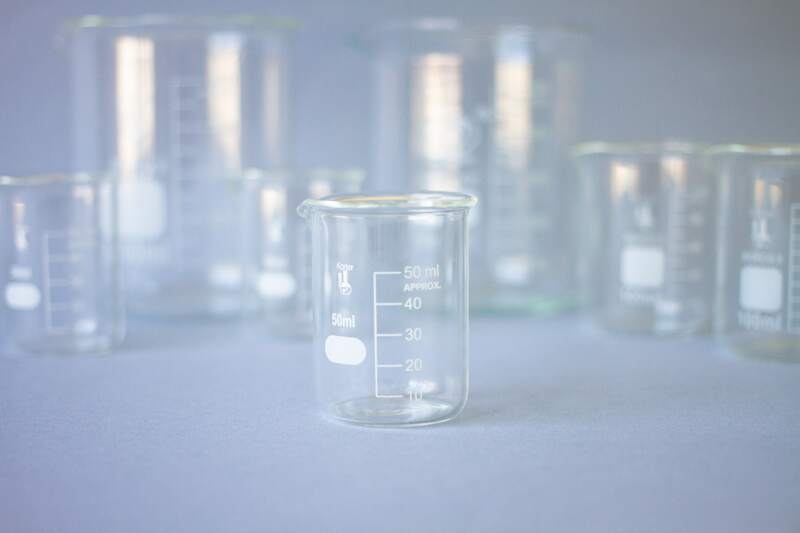 We only rely on the rough measurements printed on the side of these Pyrex beakers when measuring out perfumer’s alcohol in the largest cylindrical beakers for experiments. For exactitude, we always use weight over volume.